This gorgeous finger knitting fall wreath is the newest addition to the Spooky Saturdays series, and it is brought to us by the wonderfully talented Julie over at Julie Measures. Isn’t it just yummy?! Let’s turn the time over to her! Hi guys! My name is Julie and I love to make things. I’m a craft and food blogger over at Julie Measures where I share DIY projects and recipes. I love to bake (and eat) and my favorite crafts relate to yarn. I knit, crochet, and even do some cross stitch. I love making wreaths for the holidays and my favorite are yarn wreaths. These start with wire wreath frames, yarn, and then embellishments. For fall I’m making a fall wreath that can easily be upgraded for a spooky Halloween look. Finger knitting is the base for my fall wreath. The first step for finger knitting is wrapping the yarn around your fingers. Wrap around your first three fingers, back and forth so that you have two rows on each finger. The second step is to pull the bottom row up and over the top row. Then just keep repeating wrapping the yarn so you have two rows and pulling the bottom row over the top row. When the piece is as long as you want simply cut the yarn and bring the end through each of the loops. I did mine in white for the wreath base. It made a nice neutral base for me to add embellishments to. And I can change out the embellishments each season! To add some color for this fall wreath I criss-crossed some orange yarn over the top. For a fall look I added some fabric leaves. I used three different leaf patterns, and cut half of the leaves out of a leaf print fabric and half out of some duck cloth. Then I hot glued the leaves together and to the orange yarn on the wreath. 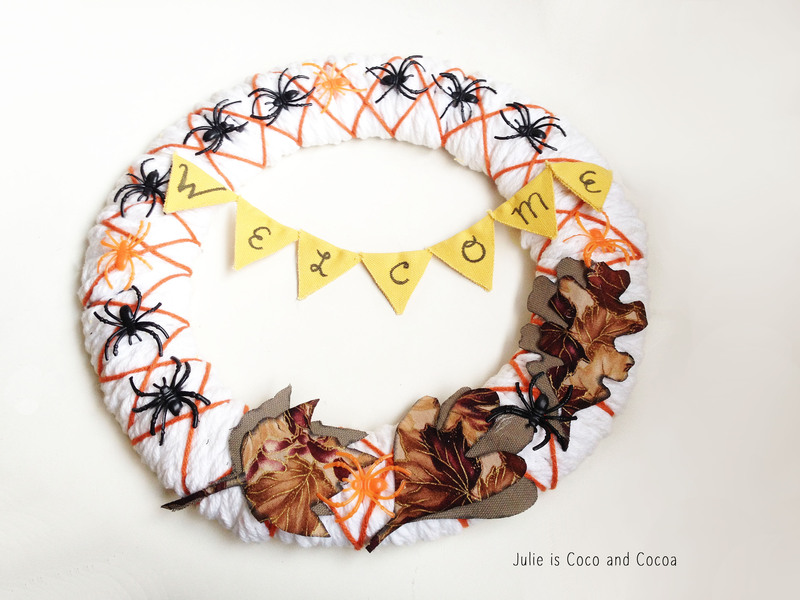 Add a sweet little ‘Welcome’ bunting and it’s perfect for fall! But, if you want to make it a little ‘spooky’ for Halloween, it’s super easy!I picked up a package of those plastic spiders and simply added a handful of them to my wreath. Then when Halloween is over I can take the spiders back off and keep using my fall wreath right through Thanksgiving.